Amazon Data Lifecycle Manager for EBS Snapshots provides a simple, automated way to back up data stored on Amazon EBS volumes. 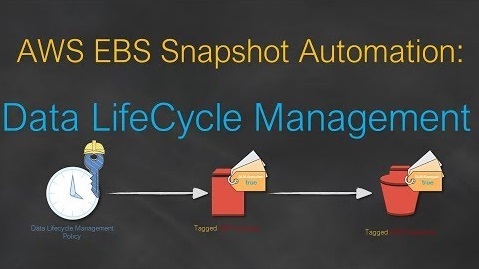 You can define backup and retention schedules for EBS snapshots by creating lifecycle policies based on tags. With this feature, you no longer have to rely on custom scripts to create and manage your backups. To get started Go To Lifecycle Manager in EC2 service via AWS Console. Click on Create Snapshot Lifecycle Policy. Filling details in snapshot policy according to your requirement. Now our automatic EBS snapshot Lifecycle is created and it takes a snapshot of selected EBS volumes according to policy. You can also Modify or Delete Lifecycle Policy. A Snapshot will be taken within one hour from the start time. and you can see it in Snapshots tab in EC2 service.